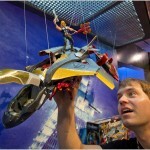 Check out new images of the upcoming Marvel Avengers Movie Toy line by Hasbro from Toy Fair 2012. 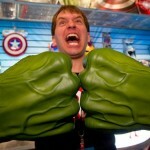 Included are the first real nice images of the The Avengers S.H.I.E.L.D. Helicarrier! 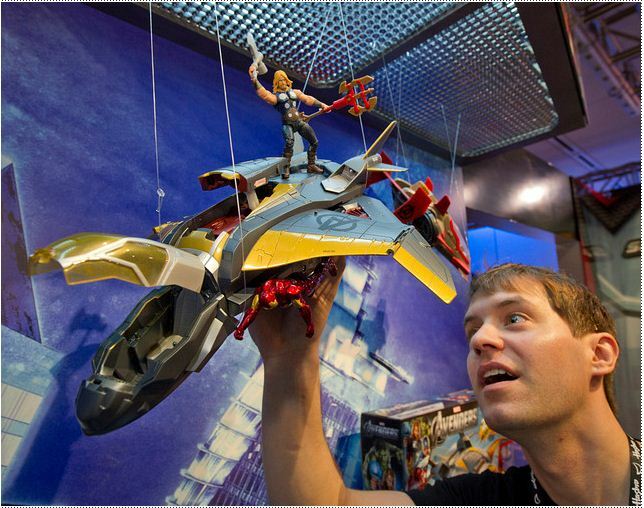 "Toy demonstrator Clayton Hodges adjusts the "The Avengers Quinjet" suspended over the "The Avengers S.H.I.E.L.D. Helicarrier", part of Hasbro's Marvel "The Avengers" line of toys at the company's American International Toy Fair showroom in New York, February 10, 2012. HASBRO/Ray Stubblebine via Insider Images"
It will probably be a lot of fun for the kids (young and old) who get it. Me, I'm probably going to pass. Not enough room to display something like that and it will probably be out of my price range anyway. question,why is everything a link,why do you not just post the pics and or info in the post? Goddamn. Look at that Helicarrier! I didn't think they would make it so big. I can't wait to see how that thing looks loaded down with smaller vehicles. That thing is going to be insane for micro dios. They should have really thrown some Pym particles heroes on it, but since they aren't movie line I can see why they didn't. I know the second I hang that thing from the ceiling in my home office/rec room it's going to end up loaded down with micromachines/hotwheels military vehicles, jets, and 3.75'' pym particles characters. Haha, weren't people complaining about how small it looked before? Whoa... that's pretty big looking. Neat. Its an optical illusion if you look at it next to his arm(or use one of the figures for scale) its really not that big,it just looks bigger because its basically a huge straight line running through the picture from foreground to background,the Hasbro photographer sure earned his wages with that shot!! hunks of crap is what they are. the avengers line is definitly not for collectors. So disappointing. theyre comic series figs line could have been epic. The Quinjet looks pretty sizeable. If it can fit that thing on the deck, it's probably a bit bigger than most of us thought. Looking at these...the Quinjet might repaint into a nice AIM fighter- but it's weird how long that cockpit is- it looks like a two seater but there's just one seat! 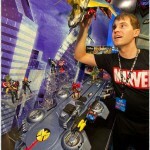 The helicarrier has been confirmed to be 3 ft long or just under that hasn't it? How much bigger did you guys want it to be? Though I gotta admit, my only major complaint is how it has hatch doors for 1:18th scale figures when they really should have played up the imagination by giving it smaller hatch doors and the really mini-figs from the IM portable playsets that were akin to mighty max. That would have sold me right off the bat on it to pay full price instead of waiting for clearance. As it is, I hope that side canon at the very least is removable. 3 feet is the length of my desk which isn't bad at all. i think i was just hoping it could open up like the Rise of Cobra Pit playset. like if it folded open lengthwise and had a command center of some sort in the middle. I wonder how much more expensive that would have made it though too. As it is, it's probably pushing 79.99 to 149.99 somewhere on size alone. Some kind of open feature would have been nice, but it also would have meant you'd have to choose between playing with it open, or emptying it/clearing off the top to open and close it. That's another reason I wish they made it for the minifigs instead. So it looks movie accurate by scale comparison, and if you really want, you can still put the 3.75'' figures on it. when i was a kid i was moving my toys all over the place. so choosing whether to have a playset open or closed just made the set more awesome and versatile. or at least maybe one half of it could pop open like that IM2 rolling battle headquarters where there's a cockpit area, an armory station, and some kinda display thing. or part of it can be taken off and turned into a battle station like some of those star wars ones. that kinda stuff is right up Hasbro's alley. in the high rez pic there's these black panels all over it for i assume storing figures or weapons. just waiting on a demo video from the floor. 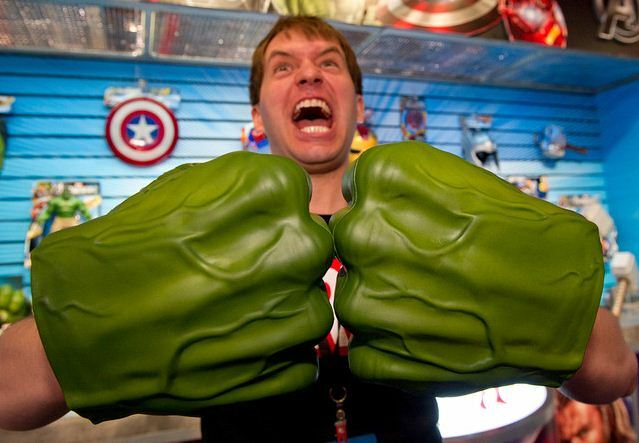 Hulk hands again...ugh...those are just gonna shelf warm. I remember the last batch taking forever to sell even at clearance prices. 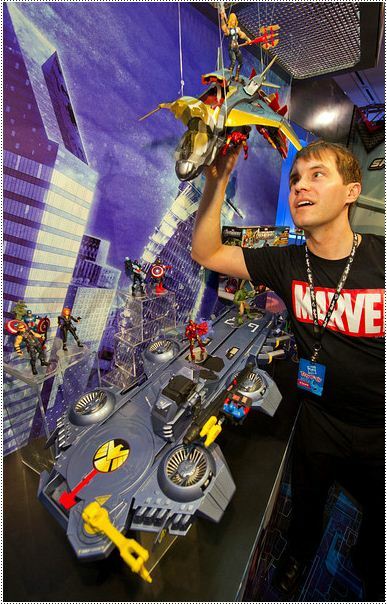 Damn, I want the Helicarrier obviously. Will use it with my Minifigs. Space is gonna be an issue now, I have a 3 foot long USS Flagg, 3 foot long PotC Queen Annes Rvenge, and now I have to shoehorn in a 3 foot Helicarrier, along with all my "regular" sized vehicles? Im looking forward to seeing it in someones collection with all the avengers on top. LOL "Wifes gonna kill me" brilliant. there could be a lot worse of a man than wanting a 3 ft helocarrier in your house believe you me. I hope she will understand your need for it! She travels for work, I work from home. So she'll just come home from working out of state to see the new remodel job! Like the old saying goes" It's easier to ask for forgiveness than to ask for permission!" Any word on when this is going to drop? Must own. I noticed too that it isn't out. I saw my local TRU has this huge display for all things Marvel and the carrier wasn't there.